The Carbide 100R is a Mid Tower case from Corsair that adds to the family of 100 Series cases. The case has all the versatility that all serious PC builders crave. The clean and modern exterior design is something that all users can agree with; the tool free access to the interior allows you to access your components for maintenance and cleaning very easily. The ranges of cooling options are all available to the builder. It’s the performance PC platform in stealth mode. With a mesh-free front panel, flush-mounted side panel window and clean lines, the 100R is both professional enough for the office and customizable enough for any home PC build. The simplicity begins with tool-free 3.5” and 5.25” drive installation, and all four hard drive trays provide solid-state drive support so you can mix and match to fit your needs. On the outside, dual USB 3.0 front panel ports give you quick and easy access to the latest high-speed portable hard drives and flash drives. For maximum airflow the 100R comes with one 120mm corsair fan included, this allows for the hot air generated from your PC's components to be directed out of the case. The Carbide 100R has room at for radiators, allowing you to quiet down your GPU and CPU with liquid coolers, this also allows you to get better overclocks out of your components for better quality gaming. 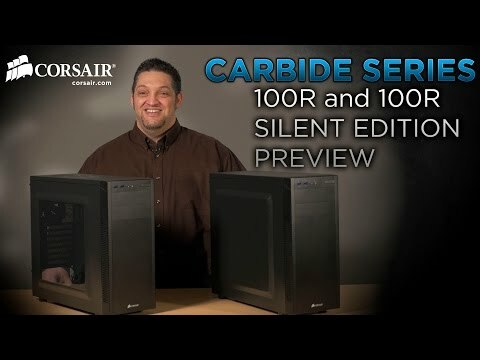 Corsair Carbide Series 100R Mid-Tower Computer Chassis with Side-Window, USB 3.0, Cable Management w/o PSU is rated 4.8 out of 5 by 4. Rated 4 out of 5 by Sal79 from Good entry level PC case Great entry level case. Very light for what it is but sturdy enough. Lots of options regarding HDD, or SSDs, fans etc. If using an aftermarket cooler, check the height of the cooler before purchase. This case is not made to take a 240mm water cooling radiator (without modifications) so if looking at water cooling options, use a 120mm Rad. Finish is great, would recommend this case for anyone on a budget as it has many features found in higher spec cases. Rated 5 out of 5 by Meng from Great product Nice design and comes with ties to keep your cables neat. The drive rack is very simple to use and well organized. Rated 5 out of 5 by Hawkzz from Great price Looks pretty good brought this for a family PC build, Far better quality than I thought it would be at this price, but then it's Corsair and always been very impressed by there quality.. Rated 5 out of 5 by Henley from Great case for the price! Best budget Excellent case good cooling sliek design with a window looks a lot more expensive than it is a decent product for someone on a budget couldn't ask for more, for the money. What air cooler from Corsair Hydro Series is compatible with this case? I would like to change the cooling from PC that i bought from you, but i have no idea which of the corsair hydro series would be compatible with the case to fit and cool my processor. Use a single 120mm radiator cooler such as Corsair H55, H60, H75, H80i as a 240mm radiator will not fit without modding the case. I managed to front mount a 240mm Corsair H100i as it would not fit up at the top. This required the removal of the hard drive bay and relocating my HDD and SSD to the 5.25&quot; optical drive bay. Does this case come with fans included? Does this case come with included fans or will i have to buy them Separately?